The British Royal Mint has launched a new online site featuring a refreshing design, easier navigation, interactive elements, and more detail for coins and their history. A welcomed improvement is within the product pages. The top panel contains an interactive element featuring each coin’s design through various image sideshows. Retained is the ability to zoom into the coin for a closer look. 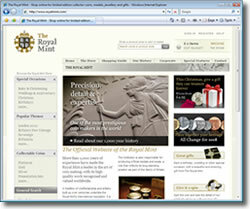 New is the 360 degree spin on selected coins enabling collectors to better see both sides of the coin in greater detail. The lower panel has changed to an interface of tabs with "Overview," "Background & History" and "Specifications." In the past, a click on specifications launched a new window that could get "lost" easily. Also previously, a coin’s overview and history were on the same page, requiring extra scrolling to find either. The site’s top navigation now utilizes more space, making it easier and less click intensive to navigate.